Substitute House Bill 14 of the 129th General Assembly was passed and signed into law effective in May of 2012. The law redefined the definition of dangerous and vicious dogs and created a new definition of nuisance dogs. Dog Wardens and other law enforcement officers are required by law to designate dogs within their jurisdiction as nuisance, dangerous or vicious if they have reasonable cause to believe they meet the definition. 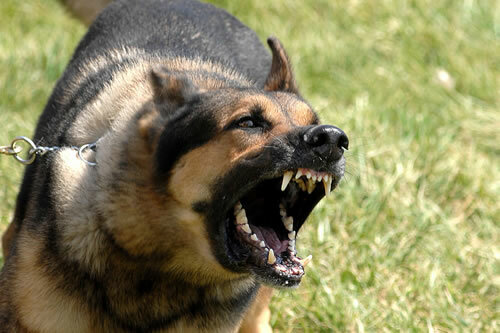 Subject to 955.11(a)(3)(b), nuisance dog means a dog that without provocation and while off the premises of its owner, keeper, or harborer has chased or approached a person in either a menacing fashion or an apparent attitude of attack or has attempted to bite or otherwise endanger any person. Caused injury, other than killing or serious injury, to any person. Subject to 955.11(a)(6)(b), vicious dog means a dog that, without provocation, has killed or caused serious injury to any person. Dog Wardens and other law enforcement officers will provide dog owners, keepers or harborers with notice either in person or via certified mail whenever they designate a dog as nuisance, dangerous or vicious. It is in the dog owner, keeper or harborer's best interest to accept a certified letter containing a designation notice as it provides time sensitive appeal information and informs the owner, keeper or harborer of the dog's designation (e.g. nuisance, dangerous or vicious). Failure to accept the certified letter does not stop the designation process. Each designation notice is required to include instructions for filing a request for a hearing in the county in which the dog's owner, keeper or harborer resides. Owner, keeper or harborers that disagree with the designation of the dog as nuisance, dangerous or vicious may appeal the designation in writing, submitted to the municipal or county court having jurisdiction over the owner, keeper or harborer's residence, not later than ten days after receiving notice of the designation. If a hearing is requested appropriately and timely, a hearing will be held and the person who designated the dog has the burden of proving, by clear and convincing evidence, that the dog is a nuisance, dangerous or vicious dog. The owner, keeper or harborer and the person who designated the dog may appeal the court's final determination. Owners, keepers or harborers of dogs designated as dangerous or vicious are subject to stricter confinement requirements, liability insurance if determined by a Judge for dangerous dogs and mandatory for vicious dogs, dangerous dog registration requirements in addition to the regular dog license and other requirements. The dangerous dog requirements form below outlines the requirements for owning dangerous and vicious dogs. The dangerous dog registration form explains the process to obtain the annual dangerous dog license as well as additional requirements.